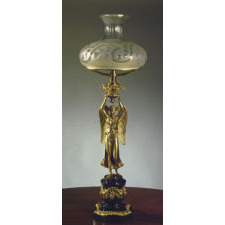 The blown and cut glass shade on a flattened doughnut-shaped font held above a figure of winged Nike, goddess of victory, on a stepped cylindrical pedestal base decorated with swags and garlands on a molded polygonal base. Condition: Excellent; The matte and burnished lacquered surface has been restored to its original appearance, electrified. Messenger was among the largest and most successful of the many manufacturers of lighting based in Birmingham, England, who exported their products to the United States. First appearing in the Birmingham directory as Messenger and Phipson in 1797, the firm survived into the twentieth century. Virtually all oil lamps in America prior to 1830 were imported from England and sold through retailers in the major cities on the Northeast seaboard. Several American manufactures began making Argand lamps in the 1830's including Henry N. Hooper and William Carleton in Boston, Starr, Fellows and The Dietz Company in New York and Cornelius in Philadelphia. This monumental example was retailed by Henry N. Hooper & Co., Boston (active 1832-1868) and it appears as item no.176 in the 1850 Hooper catalogue; the earliest catalogue from this company that is known, although, presumably, an earlier catalogue was produced. Hooper refers to the “faux-d’oré” surface, developed to simulate mercury gilding, as “or-molu.” Hooper’s factory was on Causeway Street and their store at 24 Commercial Street. Although Hooper was a manufacturer of brass lighting as well as supplying a broad range of copper and brass products, this model was an import, private labeled by Messenger. A “sinumbra” lamp works on the Argand burner principal but the font or oil reserve is in the shape of a flattened doughnut, allowing light to stream directly out and down through the hole onto a table without the font blocking light and casting a shadow, hence “without shade.” Sinumbras that have a shade that sits on the outside rim of the font obscuring it, are known as Isis lamps. Figural Sinumbra lamps are rare and ones of this scale are rarer still. This is the finest example of a Sinumbra lamp that we have ever seen.